So it was described by the UK’s Mail Online, the web component of the Daily Mail newspaper, in a recent article showcasing the destination’s world-class spas, endless beaches, luxury and the good taste of celebrities such as Kim Kardashian. The wide variety of possibilities offered by the Riviera Nayarit as a tourism destination continues to gain positioning wherever its attractions are known. In Europe, it’s already being touted as “the hottest new destination” in Mexico. This was confirmed by the website Mail Online, cyber-sister to the Daily Mail newspaper. This site is one of the most important and most influential sites in the UK and the English-speaking regions of Europe and the world at large, with 179,822,518 unique visitors on a monthly basis. The article titled “Why Riviera Nayarit is Mexico’s Hottest Destination” gives a list of reasons why. 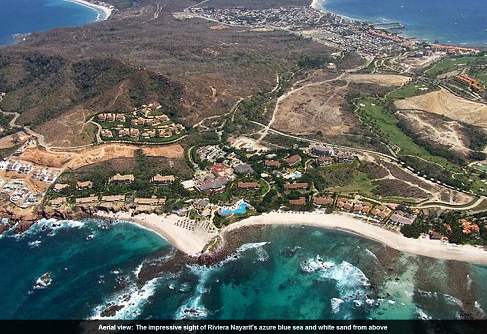 According to the article published on June 19th, the destination’s world class spas, endless beaches and the largest and most modern yacht marina in Mexico are enough, though they go on to say that “if it’s good enough for Kim and Kanye…” in reference to the celebrities’ recent visit, a nod to the destination’s popularity among the rich and famous. The article was published on the site without any direct intervention on the part of the destination, something that’s happening more and more often as a result of the constant public relations efforts undertaken by the the Riviera Nayarit in its different target markets. This type of support is very welcome and is a great aid to continue filling the new weekly flights out of Manchester and London to the Vallarta-Nayarit international airport.